Made in China things are cheap but there are clones of Made in China things too. The situation become worser if the name of the components used is not known. There are different type of Arduino sound sensor modules available in the market with variable price and look. 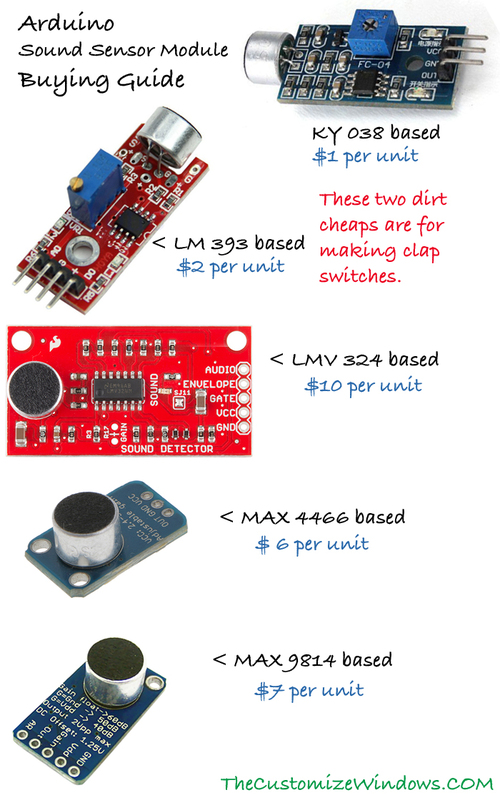 Here is a brief Arduino Sound Sensor Module buying guide. We do have guides with Arduino and microphone like Arduino clap switch or Arduino sound meter. Need of an Arduino Sound Sensor Module is for more complicated works avoiding building a complex circuit repeatedly on breadboard. Sparkfun sells LMV 324M one, which costs $10. Adafruit sells MAX 4466 and MAX 9814 based, which costs $7. KY-038 based are dirt cheap, costs around $1 per unit. Of course the quality of microphone matters as well as the IC used. Arduino Sound Sensor Module Buying Guide : What to Buy? If you are seeking a good module to measure sound levels, you possibly try a MAX 4466 based module or MAX 9814 based module with an adjustable gain for MAX 4466. LM 393 is a comparator chip, they usually has a potentiometer and no amplifier with VCC pin, a GND pin, an Analog out pin and a digital out pin. This is good for making clap switch. KY 038 based are worser, with similar pins. They are also good for making clap switch. If you want “just a sound sensor” both LM 393 and KY 038 are similar. MAX 4466 and MAX 9814 based modules actually have real amplifiers. The amplifier has excellent power supply noise rejection, you can set the gain from 25x to 125x. As for buying, you need perform search on sites like Ebay with the IC number like MAX 9814. There are sellers who somehow import stuffs from Hong Kong. You are likely to get a MAX 4466 at cheap rate with ugly edges of PCB (you can file it). There is nothing wrong to buy a dirt cheap KY 038 based module with it. Another things you should look is how many sample codes available on GitHub and how many YouTube videos actually available which are closer to your purpose. Cite this article as: Abhishek Ghosh, "Arduino Sound Sensor Module Buying Guide," in The Customize Windows, September 8, 2017, April 21, 2019, https://thecustomizewindows.com/2017/09/arduino-sound-sensor-module-buying-guide/.